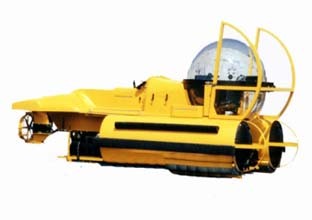 The SEAmoblie Professional is a submersible designed and built by SEAmagine Hydrospace Corporation. No longer in production, the SEAmobile Professional is a two-person sub which had the capability, in top-spec form, to dive to 1,500 ft (457 metres). The occupants had an exceptionally good view of their surroundings thanks to the bubble-like cockpit.